MWC 2014: Sony Xperia Z2 Tablet is "world's most powerful" tablet | What Hi-Fi? 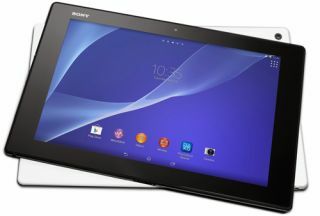 Sony has hit the ground running at MWC 2014, with the launch of the Xperia Z2 Tablet, which claims to be the world's lightest and slimmest waterproof tablet. Joining the new flagship Xperia Z2 smartphone, the new tablet has a Live Colour LED screen, built-in digital noise cancelling and "the world's fastest processor in a tablet". A 10.1in tablet, it's certainly big enough to be borrowing from the Sony Bravia TV division, and that's what Sony has done with the full HD Triluminos display for mobile complete with X-Reality processing, both also seen on the Z2 phone. As well as integrated noise cancellation technology which will reduce ambient noise when paired with the MDR-NC31EM noise cancelling headset, there's a Front Surround tablet speaker, too. But we'd prefer it if you stick with the headphone/audio output. Measuring 6.4mm thin and 426g (for the WiFi model, the 4G LTE/3G model is 439g), it's certainly a svelte slate for such a big screen. As with the phone, the OmniBalance design aims to make for an aesthetically pleasing casing to hold. And yes, it's entirely waterproof. The Sony Entertainment Network for music (Music Unlimited) and movies (Video Unlimited) are to the fore, with free exclusive film content on offer. Claiming the world's most powerful tablet tag, the Sony Xperia Z2 Tablet has a Qualcomm Snapdragon 801 processor with a 2.3 GHz quad core processor, while a hefty 6000mAh battery claims up to 10 hours of uninterupted audio/video playback, which sets it apart in the tablet market. There's an optional Bluetooth cover and stand should you want to get serious with your tablet, plus front and rear cameras if you want to be taking pictures. No doubt the first of many tablets to come out of MWC 2014 with a host of bold claims, the Sony Xperia Z2 Tablet is set for release in March.